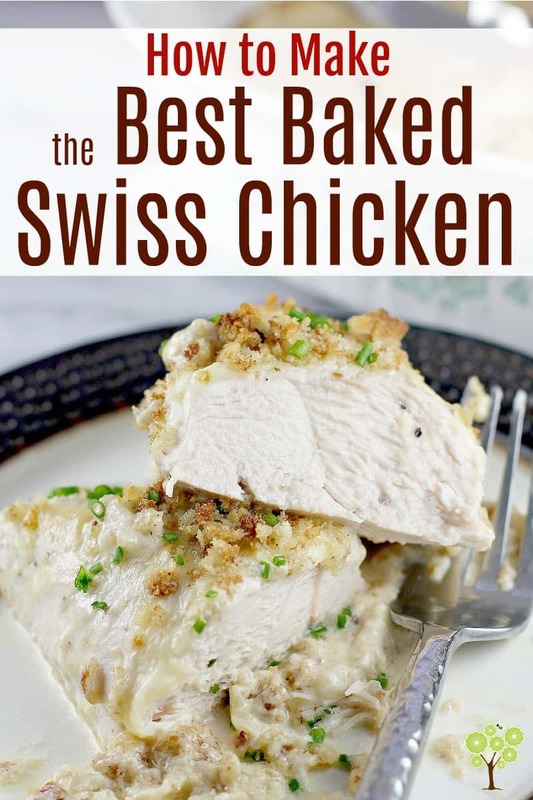 Swiss chicken, if you’ve never had it, is an uber simple, uber quick, uber comforting tasty classic chicken recipe that takes pretty much no effort to make whatsoever. 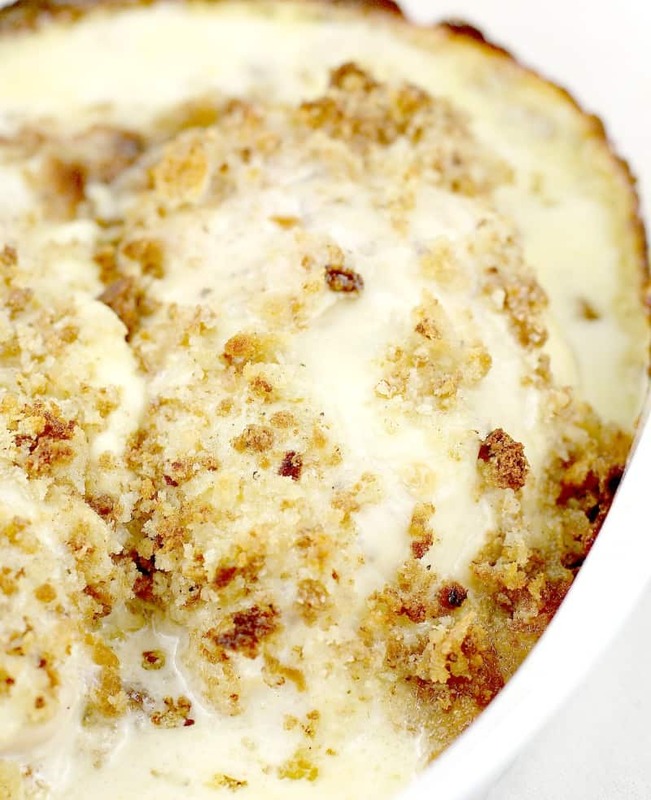 Layer chicken breast, then cheese, then a creamy sauce in a bake dish. Top with a stuffing layer, bake, and serve. Easy easy. But, the issue is that the creamy sauce most Swiss chicken recipes out there use one or several questionable ingredients. Condensed cream of mushroom or cream of chicken soup. First, this is SWISS chicken! So no, no parmesan. But even aside from that, I wondered if I did not use condensed soup or any of the rest, how could it be? Not that I am against those ingredients. They have their place, like condensed soup in my Jalapeno Popper Hash Brown Casserole, BUT I wondered if Swiss chicken could be made better. MUCH better. And I learned, and what this recipe represents, is that those ingredients I listed above are simply not needed and are actually heretical for making the best, creamiest creamy Swiss chicken recipe ever in today’s day and age. Am I right? This is just BETTER in every which way we look at it. I love this recipe SO much, because it is based on a tasty tasty classic. I have made that classic recipe foreverrr, too many times to count, and I have always loved it. But THIS one is even BETTER. SO much better. 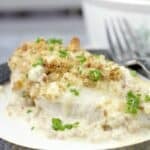 Creamy chicken, cooked perfectly, and it is Not Much More effort than the original baked Swiss chicken. First, we make a delicious creamy sauce using CREAM. Right? How crazy [eye rollll]. But honestly, we just take 15 minutes and make a creamy sauce with cream and Dijon and WINE and it is so good. 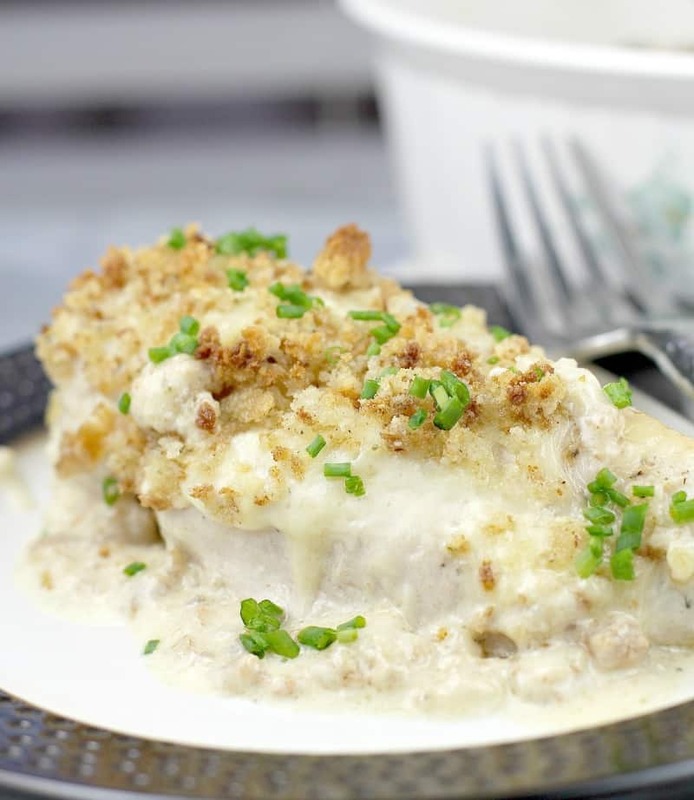 Then, the rest of my recipe proceeds completely like the classic – top chicken breast with cheese, sauce, crunchy topping, and bake. Just a couple extra steps make for SUCH a better experience and such tastier cheesy chicken. So, no this is not a throw-it-together in 5 minutes, get-it-in-the-oven and you’re done recipe. We reduce a little cream, make a little (and by far yummier) saucy sauce, but that is the only difference. This is still an easy recipe, and you can have this on a weeknight. This is also a recipe that, without the canned stuff, you can feel prouder serving as a special occasion dinner, Sunday meal, and so on. 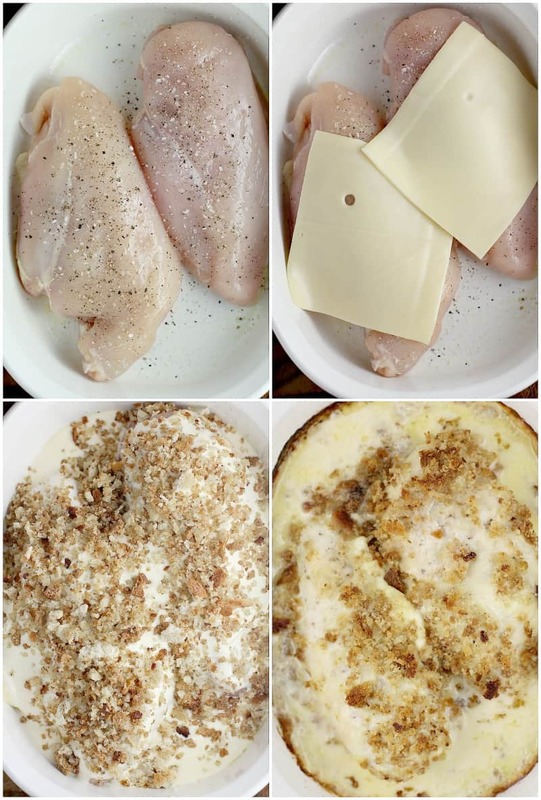 Creamy baked Swiss chicken For The Win. 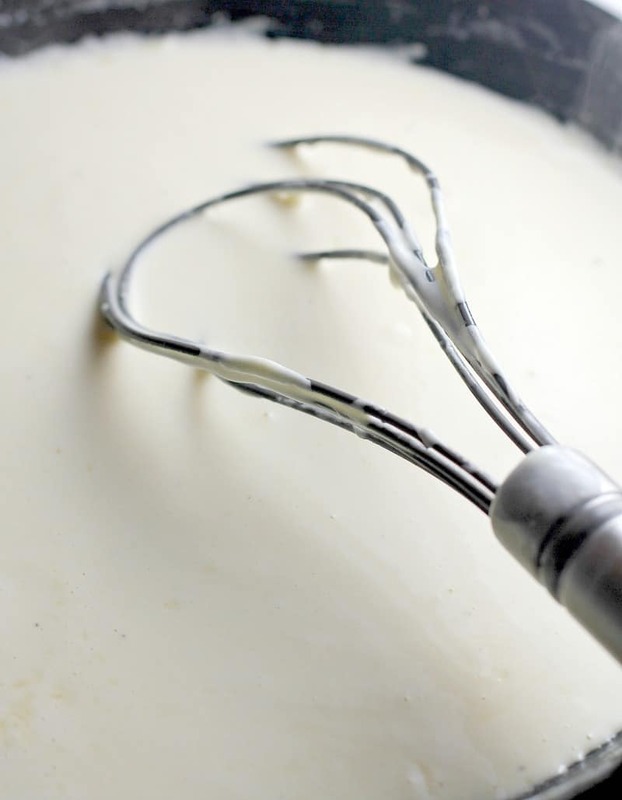 Use a rubber spatula or silicone-coated whisk to occasionally scrape the sides of the skillet while the cream is cooking. Do not add the wine before the cream is allowed to thicken or it will curdle. Take care that the cream doesn’t boil over the pan. Start on medium, then reduce heat as it gets simmering. If you are concerned about the alcohol in the wine, this cooks off in the oven. I serve this to my kids, no worries. Use a meat thermometer to check the internal temperature of the chicken. This way you won’t get rubbery chicken. Allow the chicken to rest 5 minutes before serving. So that’s it folks. 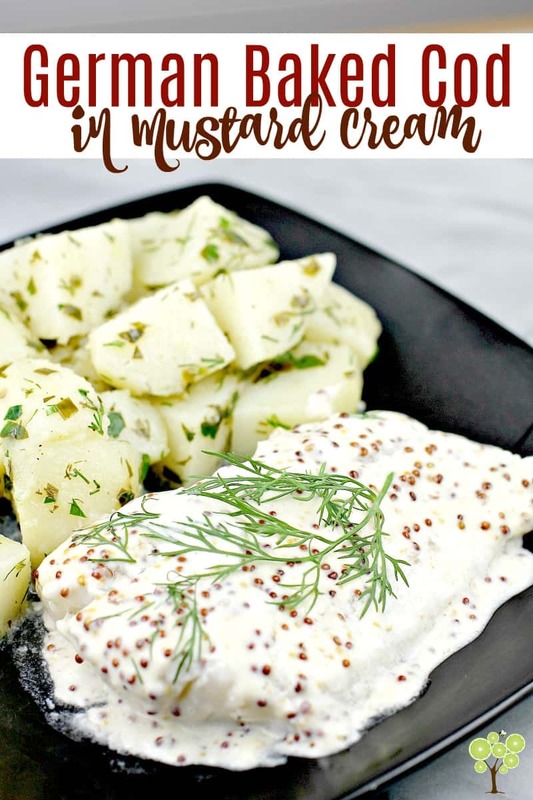 An easy classic recipe, made-over to a MUCH better, but still easy, delicious recipe worthy enough as a company dinner. 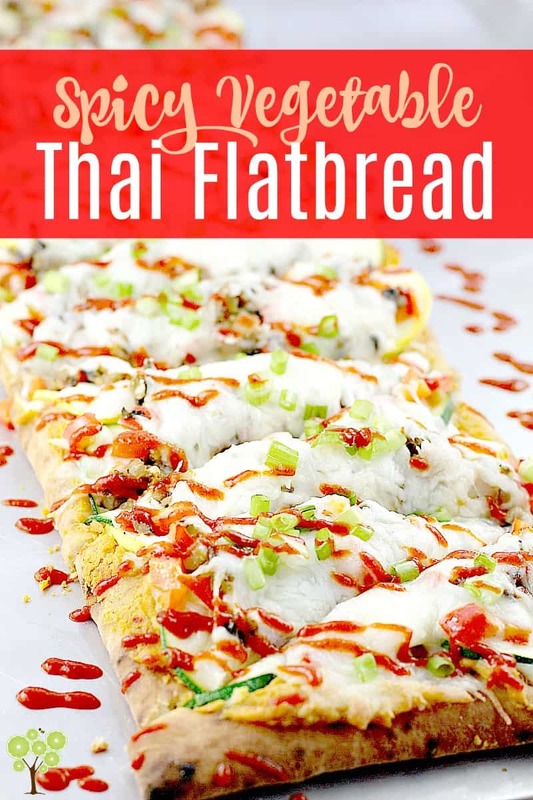 Make This Recipe, it is SO good, SO tasty and easy to make. A perfect dish to serve for whenever and you can do so proudly. 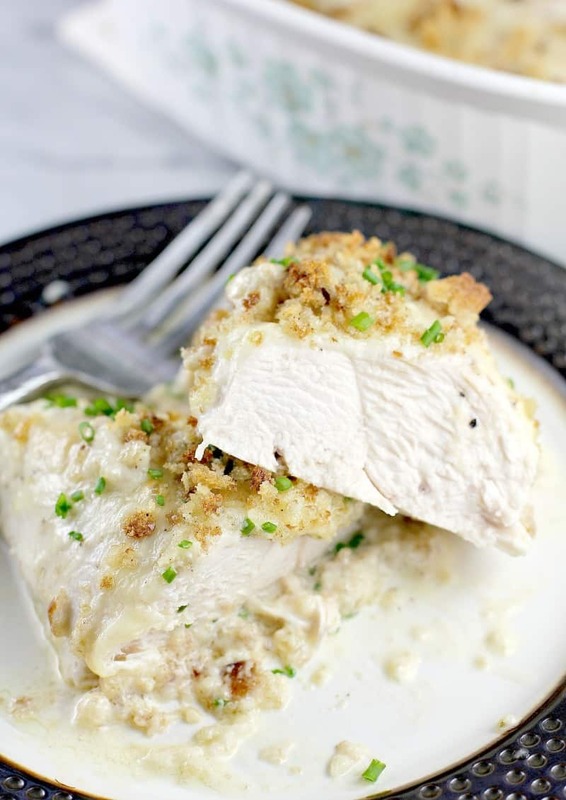 Classic creamy Baked Swiss Chicken, made over with better ingredients for a richer, tastier meal than ever before. In a medium, nonstick skillet, add the cream and 1 tablespoon of butter. Simmer over medium-low to low heat until volume is reduced by half (~10 minutes; see Tips above). Add the wine and Dijon. Whisk until smooth. Bring back to a simmer until thickened once more (~5 minutes). Season with salt and pepper to taste. Put breasts in a baking dish. Season with salt and pepper. Lay a slice of cheese on each. Pour the cream sauce over the chicken. Combine the butter and stuffing. Layer this mixture over chicken. Bake at 350F for 35-40 minutes or until a thermometer inserted in the thickest part of breast reads 160F. Remove from the oven and let chicken rest 5 minutes (internal temperature will go up further to 165F which is perfect doneness). Remove from the oven and rest 5 mintues. Serve.